These Lemon Garlic Zucchini Noodles with Roasted Cauliflower are full of flavor and only contain a handful of wholesome ingredients! Free of gluten, grains, dairy, & eggs. Vegan, vegetarian, paleo, & whole30 friendly too! 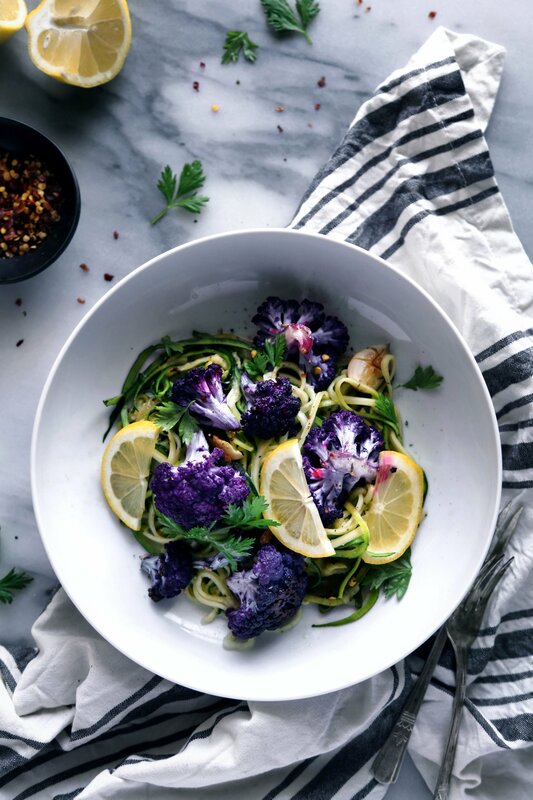 Whether you look at zoodles as “pasta” or just a food which resembles it, zucchini noodles are definitely a fun and tasty way to eat more veggies! I’m in love with purple veggies, if you haven’t already noticed from this, this, and this recipe. This cauliflower tastes the same as its white counterpart, but is just a vibrant and beautiful color. Regular cauliflower can most definitely be used if you can’t find the colored variety. I’m not a fan of plain ol’ cauliflower. It’s usually ignored on veggie trays for a reason. But something happens to this bland, flavorless vegetable as it roasts in the oven. It brings out a toasted, nutty flavor that can’t be described as nothing other than delicious. This dish is healthy, fresh, and full of flavor. I hope you give it a try! Do you have a spiralizer? What’s your favorite way to use spiralized veggies? This lemon garlic zucchini pasta with roasted cauliflower is a simple and healthy dish requiring only a few, wholesome ingredients. Feel free to add your protein of choice, like grilled chicken or shrimp. Preheat the oven to 450F. Wash your head of cauliflower and remove the hard center stem. Cut the remaining cauliflower into bite-sized florets and spread evenly across a large baking sheet. Drizzle with a bit of oil, chopped garlic, and a generous sprinkle of salt and pepper. Toss to evenly coat. Place pan into the oven and bake for 20-25 minutes until cauliflower is slightly toasted is some areas and tender when pierced with a fork. More or less time may be needed depending on the size of your florets. While the cauliflower is roasting, begin spiralizing your zucchini. (This spiralizer is awesome!) Pat dry, if needed, and set aside. In a large pan, heat about a tablespoon of oil over medium heat. When the pan is hot, add onion and sauté for 2-3 minutes. Add garlic and continue to cook mixture until golden and fragrant. Add butter and let melt (optional, for flavor) then add zucchini noodles. Toss to coat. Season generously with salt and pepper and a pinch of red pepper flakes, if you want to add some spice. Squeeze the juice of the half lemon over the noodles and cook for just a couple of minutes, until zucchini has slightly softened, but still maintains a crunch. Toss in roasted cauliflower and chopped parsley, and serve. A sprinkle of grated parmesan is a good addition for those who eat dairy. Serves 2-3. What a beautiful, colorful dish! I love both cauliflower and zoodles so I’m going to have to give this a try soon. This looks SO GOOD! I recently got a spiralizer and now I’m using it for EVERYTHING! Haha! This recipe looks amazing, I can’t wait to try it! Oh how I love zucchini noodles and I love the idea of lemon garlic sauce. Great idea to include the purple cauliflower, it adds an element of fun to the recipe! Yes it’s fun. I really enjoyed making and sharing this recipe. Thank you Jenn! Your photography skills are amazeballs!!! I am a primal nutrition coach, and my mouth is drooling just reading this recipe! Pinning it to my boards!! Thanks for sharing! Oh my! That looks good! My kids love pasta and would eat almost any veggies so I need to try this at home! Belle, you should! It’s so much fun to make and so tasty! Have a lovely weekend! HOLY YUM that looks delicious! And it is GORGEOUS too! Maybe I will make it for Valentines Day for my husband! I got a spiralizer for Christmas and I have only used it once with cucumber. I think I will give these noodles a try seems very very tasty. thanks for sharing! Steph, you will have fun using it. Please let me know how you like it if you try it out. Have a great weekend! This not only looks super yummy but also super pretty! I love those purple veggies! I will have to keep an eye out for them at the grocery store! This sounds really, really yummy! But I’ve never seen purple cauliflower before so that’s a new one to me! I have cooked with purple potatoes once or twice. This looks healthy and delicious, not to mention colorful too! I can’t wait to try this recipe for a nice lunch or simple dinner. I actually love zoodles. I’ve been greatly reducing my carb intake over the past month and am down 11 pounds. This looks amazing. I also am a huge cauliflower. I’ll have to give this a try. Wow that’s great Dia! Congrats! Yum! This looks so good. I love how colorful it is, too! Hello, dream dinner! I’m obsessing over that purple cauliflower and spiralized veggies are the best! Thanks Lesley. Purple cauliflower tastes just as good and they’re pretty in pictures. Oh that looks really good. And guess what I have in my fridge? A fresh head of cauliflower. I will try this. Thank you for the recipe. Oh nice! Thanks for stopping by and for the encouragement. Now I know what I’m making for dinner! I love when my dinner is colorful and healthy! Yes me too! Thanks Greta! Great recipe! Will have to try it out for dinner. I am trying to do something fun with the cauliflower and zucchini in my fridge so this is perfect! That works out perfect 🙂 Thanks Kseniya (such a pretty name)! I love cauliflower! I had no idea there was red cauliflower out there. I was a little shocked when I saw how purple it is. It sounds like a great recipe, I should try it!